The Steam Crave Titan PWM is powered by quad 18650 cells, fires up to a maximum output of 300W. The Titan PWM is perfectly compatible with tanks of huge diameter. 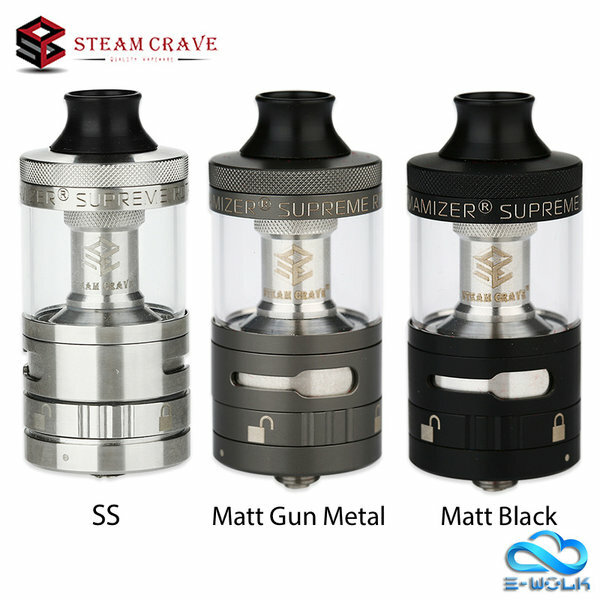 The Steam Crave Glaz RTA comes with 7ml large juice capacity, featuring new postless deck and bottom airflow design, which maximizes the vaping flavor. Plus the metal cage design, the glass cap can be protected. Aromamizer Supreme V2 RDTA is a postless tank atomizer with enhanced airflow and juice flow system. Designed by Bj Shi, Aromamizer Titan RDTA is a really huge rebuildable tank atomizer with 28ml juice capacity and 41mm diameter. Together with the biggest and most innovative LEGO build deck, Titan RDTA will bring you a high power vaping.